Where do Personal Support Workers work? For many, the work of a Personal Support Worker (PSW) is easily defined; they assist with activities of daily living and personal care in long-term care environments, such as nursing homes and retirement residences. The truth: there are innumerable employment and career opportunities available for a graduate of a PSW diploma program like the one offered at CTS Canadian Career College. One of the more common career paths for a PSW is in long-term care facilities: this is why so many associate personal support work with that type of environment. Assisting residents with personal care routines, eating, mobility needs, and recreational and social activities are all aspects that a PSW can expect to encounter on each shift. Personal support workers are caring, efficient, and empathetic, with incredible multitasking abilities. Personal Support Workers who excel in fast-paced settings excel in nursing home environments. In-home—or community—care is another area a PSW will find employment. With a provincial shift to in-home care treatment models, we can expect to see increasing employment opportunities in this area in the years to come. In-home personal support workers often find themselves working in meal preparation, light cleaning or house work, assisting with travel to appointments, grocery shopping, and general social interaction. In many cases, clients are able to remain in their homes with minimal assistance in activities of daily living, rather than requiring extensive support with feeding, various therapies, and personal care. For these reasons, older individuals or those with physical limitations might prefer to have personal support work conducted in an in-home setting. Some PSWs might find themselves in a work environment with a combination of in-home and long-term care, as would be the case working in a long-term group home. In setting such as this, personal support workers assist residents in carrying out their daily activities with attention to a variety of possible assistive needs. Such environments include residences for persons with long-term or acquired brain injuries, developmental disabilities, or any other long-term medical conditions. We are increasingly seeing PSWs in a supportive role to care teams in hospitals as well. With their skill set, PSWs are able to free up the time of other team members, such as registered nurses; with this new distribution of care, hospitals are expecting to see increased cost savings on staffing funds. With the aging population, models such as this are expected to be used more frequently to keep the level of care both accessible and sustainable for all OHIP users. It is reasonable to conclude this will translate to increased hospital employment opportunities for trained personal support workers. 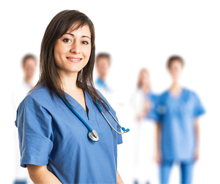 The valuable skill set of a trained and qualified PSW is becoming more recognized as a tremendous asset. With care needs expecting to double over the next decade in the province of Ontario, trained workers in this field can expect to have increasing employment and career opportunities available to them. Qualifications in a field like this will not only offer opportunities now, but even more in the future for those who have them. With plentiful opportunity and a variety of settings to explore so that you can see what environment you would enjoy working in most, pursuing training as a personal support worker could lead to a very fulfilling, enriching, and secure career.